With its 2018 additions, Adobe is concentrating on automation for time-consuming tasks and workflows, while beefing up class-leading video, audio and graphics manipulation features. "The demands and pace of video content creation are reaching levels we've never seen before. The time pressure on video professionals means the need for powerful and efficient creative tools has never been greater," said Steven Warner, vice president of digital video and audio at Adobe. "Adobe video apps like Premiere Pro and After Effects give them that power which, combined with the services available in Creative Cloud, provides broadcasters, media companies, filmmakers and YouTubers a complete ecosystem to bring their stories to screen faster than ever." Starting with Premiere Pro CC, Adobe is introducing a new one-click color matching option. 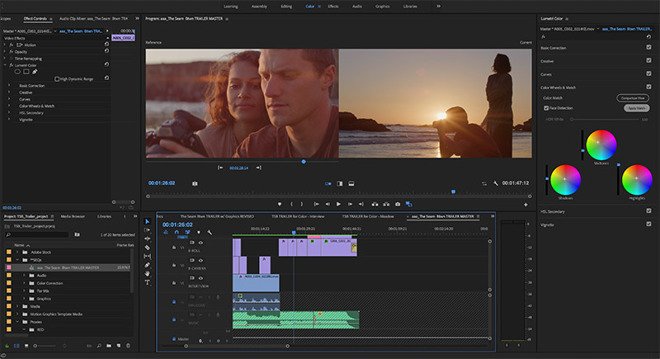 Powered by Adobe Sensei artificial intelligence, Color Match applies editable color adjustments between two clips, allowing users to quickly compare and maintain a consistent look between two shots. The feature also preserves skin tone, an often difficult task when grading. On the audio side, Premiere Pro CC now incorporates a Auto Ducking feature to normalize music levels when other audio is detected. Also powered by Adobe Sensei, the tool makes it easier to mix in dialogue and spoken audio over a sound track. As with Color Match, Auto Ducking is editable by the end user for ultimate control. Finally a new Learn panel offers easy access to tutorials designed to help new users take advantage of the video editing software. Adobe's motion graphics software After Effects CC gets a new Master Properties feature that lets users apply individual effects across multiple versions of a single composition. A new Advanced Puppet engine provides more organic deformations of graphical objects, while support for Adobe Immersive Environment simplifies 360-degree workflows for VR. Character Animator has been refined to streamline complex puppet and trigger behavior workflows. Users can drag items from the Puppet panel directly onto the Triggers panel to create and edit behaviors. Audition CC comes packed with a number of enhancements including better integration with Premiere Pro CC and enhancements to multitrack mixing and editing. Collaboration tools across Adobe's software suite enables users to see when colleagues are online, while new badges present indicators when updates are made to a project. Adobe's Creative Cloud plans start at $19.99 per month for single apps like Premiere Pro CC, while access to all CC apps, including photography software, comes in at $49.99 per month.